Foundation project: This study is funded by the Asia Pacific Network for Global Change Research (APN) - CAF2016-RR11-CMY-Pham. Climate change is one of the most significant environmental changes the human race is currently facing today. Several studies have shown that climate change has already affected human health and its impact is continuously increasing,,,. The relationship between climatic factors and disease manifestations was also identified. Most notably, the strongest associations were seen between climate change variables and vector-borne diseases like dengue,,. The anticipated variations in global temperature, rainfall, and humidity due to climate change will greatly affect the biology and ecology of vectors and subsequently increase the risk of disease transmission,,. Dengue fever is considered one of the most important arboviral diseases in tropical and sub-tropical countries transmitted to humans via mosquito bites,. According to the report of the World Health Organization in 2017, approximately 3.9 billion people are highly at risk for dengue, and an estimated 390 million infections occur annually with about 96 million having clinical manifestations. As per the Epidemiology Bureau of the Department of Health, every year, thousands of cases have been reported in the country; the prevalence of dengue escalated from approximately 46 300 in 2008 to more than 131 000 in 2017. The blood-feeding cycle of the mosquitoes is influenced by some factors such as climate. In countries where vector life-cycle is highly domiciliary, climate significantly helps in the survival of infected mosquitoes. It has been predicted that the endemic range of dengue infection will expand geographically due to the threat of global warming. The change in climate variables affects three components in dengue transmission, namely, the pathogen, the vector, and the mode of transmission. For instance, ambient temperature increases the rate of replication of the dengue virus (pathogen) within the vector and also shortens its extrinsic incubation period favoring a faster transmission from one host to another. A 2 °C rise in temperature would significantly lengthen the lifespan of the vector mosquitoes and would allow the rapid rate of reproduction and activity. This also shortens the incubation time of larva, resulting in an increased capacity of offspring production and subsequently increasing the transmission potential and incidence of dengue fever,. Precipitation and humidity also play a vital role in the prevalence of dengue fever. These factors provide a conducive habitation for the aquatic stages of the mosquito life cycle, thereby, increasing vector density. The effects of precipitation and humidity on available water resources may aid in regulating the population size and behavior of the mosquito giving strong impacts on vector distribution. Several studies were conducted to establish the link between dengue and climatic variables and to forecast dengue outbreak and occurrence based on this relationship. Studies used different approaches such as statistical and mathematical models, spatial analysis, and numerous indices to demonstrate the relationship between climatic factors and dengue occurrence. For instance, Chen and Hsieh developed a vector-host dynamic model that focuses on temperature-dependent entomological parameters to determine the transmission dynamics of dengue fever with regards to the effects of temperature. A spatial model of the socioeconomic and environmental determinant of dengue fever was also developed by Delmelle et al. to permit better detection of high-risk areas and to fortify the resiliency of the population. An association between dengue fever incidence and meteorological factors in Guangzhou, China from 2005-2014 was tested using Distributed Lag non-linear models and Generalized Estimating Equations models with piecewise linear spline functions in an attempt to provide an early warning and time control to predict the likely potential of climate change on dengue occurrence. Li et al. and Hii et al. used different methods of time series Poisson analysis, generalized additive model approach and a multivariate regression model, respectively, to develop a dengue fever model and project its incidence using climatic variables,. Wu et al. also used a time series analysis to develop a predictor model that used weather variables to forecast the occurrence of dengue fever in Taiwan. However, Autoregressive Integrated Moving Average (ARIMA) models revealed a negative association between monthly temperature deviation, relative humidity and the incidence of dengue fever. Nevertheless, best prediction models for dengue may vary from one region to another due to their complexity and methodology, and their high dependence on the nature of the variables used and the type of data collected. Therefore, there is no universal model for global analysis and prediction that exists. Monitoring and predicting the incidence of dengue may aid in the early public health mitigations to minimize its morbidity and mortality. In this study, we applied the ARIMA model for dengue fever with extensive use of remote sensing data in the four selected regions of the Philippines that recorded the highest prevalence of dengue from 2008-2015. The researchers find this model the most suitable for the study because it can deal with the stochastic dependence of consecutive data and to account for auto-correlations in time-series as well as seasonality, long-term trends, and lags. To minimize the limitations of climate data coming from meteorological stations in spatial and time scales, the researchers used the most accessible remote sensing data for climate variables, namely Global Satellite Mapping of Precipitation (GSMaP) data for rainfall and MODIS LST (MOD11A2) for night and day surface temperature as a proxy for temperature. This study aims to correlate climatic factors with the incidence of dengue fever (2008-2015) to develop a predictor model that will provide a theoretical basis for scientific guidance on its prevention. This study was conducted in four regions of the Philippines that were identified as the areas most affected by dengue fever in 2015 based on retrospective data. Regions included are the National Capital Region (NCR), Central Luzon Region (Region III), Ilocos Region (Regioni I), and CALABARZON (Region IV-A). Their combined cases account for more than half (55.7%) of the total recorded dengue cases in the entire country. Among the 17 regions of the Philippines, regions IV-A, NCR, III, and I are the densest concerning population with relative percentages of 14.7%, 12.75%, 11.11%, and 4.98%, respectively. These four regions belong to the largest main island of the Philippines, Luzon, which is located on the northern part of the archipelago [Figure 1] and is regarded as the political and economic center of the nation. Figure 1: Regional Philippine map. Image was taken from Neda Office. 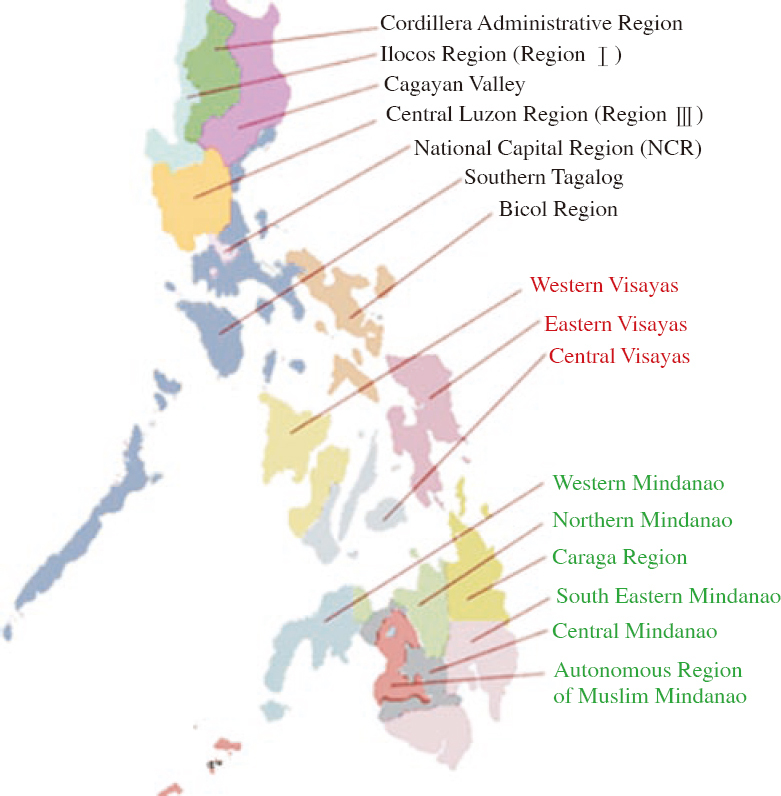 The Southern Tagalog Region is divided into two: CALABARZON Region (Region IV-A) and MIMAROPA Region (Region IV-B). Because of its geographical location, the entire Philippines only experience two seasons based on rainfall volume, namely: the wet season (May to October) and the dry season (November to April). With regards to temperature, the warmest months are from March to October and the coldest months are usually recorded during November to February due to the winter monsoon. For the researchers to extensively use remote sensing data, with the advantages of spatial coverage with high resolution and temporal availability, they utilized the GSMaP data as an alternative for surface rainfall measurement. The daily GSMaP/MVK (version 6) data with a spatial resolution of 0.1×0.1 degrees were extracted and accumulated to calculate the monthly amount of rainfall. Monthly Land Surface Temperature data from MODIS LST (MOD11C3 with 0.05×0.05 spatial resolution) with a 1 km spatial resolution was also used as a proxy for air temperature. In addition to climate variables, one of the most commonly used remote sensing-derived environmental variables, the normalized difference vegetation index (NDVI) from MODIS (MOD13Q1) with a 250 m spatial resolution was also used for modeling its influence on dengue. 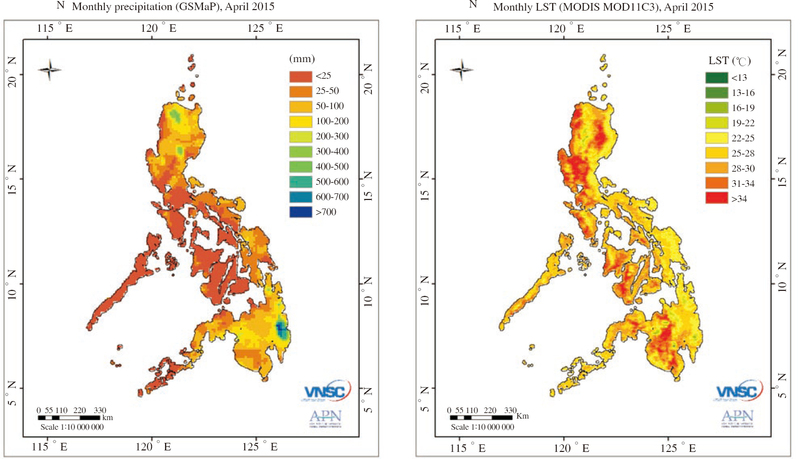 These remote sensing-based parameters were aggregated to compute for the mean monthly variable for the Philippines as presented in [Figure 2]. Figure 2: Monthly GSMap data and LST data. Dara in Figure are not overlapped. For example, the first one is <25, the next will be 25<= and <100, and so on. To suit the models to the monthly incidence of dengue in the four regions by statistical “forecast” package in RStudio software, the Box-Jenkins methodology was used. The gathered prevalence of dengue from 2008 to 2014 were statistically treated to develop a time series model that could project possible incidence of dengue. The recorded cases during the year 2015 were used as controls for validating the model. A natural log transformation was also used to stabilize dengue counts and avoid a non-constant variation of the cases. The model was structured based on the standard form of the ARIMA (p, d, q)(P, D, Q)s, where p is the order of auto-regression; d, degree of differencing; q, order of moving average; P, seasonal auto-regression; D, degree of seasonal differencing; Q, seasonal moving average; and s, seasonal period. In order to fit the log-transformed time series data without covariates, different forms of ARIMA models (different combinations of p, d, q, P, D, and Q) were tested. The best ARIMA model was selected with the lowest Akaike Information Criterion: measures the relative goodness of fit of a model across the four regions. Afterward, using the selected ARIMA components (p, q, P, Q from 0 to 2), multivariate ARIMA models were fitted with log-transformed dengue cases in relation with all the climate variables and time lags, which were chosen by their best correlation with dengue. Finally, variables with P-values that met 95% level of confidence were restricted via backward elimination and were included in the final model from all independent variables (rain, LSTd, LSTn, and NDVI). Firstly, each data from the four regions were examined to show seasonality and interannual variations of dengue incidence with climate and environmental variables (rain, LSTd, LSTn, and NDVI) during the period 2008 to 2014 as shown in [Figure 3]. This was done to ensure the suitability of the ARIMA model for studying monthly dengue data in each site. Histogram, an autocorrelation (ACF) of standardized residuals and Ljung-Box test were used to verify the adequacy of each model for each region similar to previous studies,,. Figure 3: Seasonality and interannual variations of dengue incidence with climate and environmental variables. [Figure 4] shows the time series of the prevalence of dengue fever in the four regions of study from 2008 to 2015. The highest peak for both the Ilocos Region and Central Luzon Region was observed in 2011 while the highest in CALABARZON region and the National Capital Region were recorded in 2015 and 2010, respectively. A seasonal pattern was also apparent and consistent in all four regions with incidence starting to rise in June, peaking during August, and lowest during April as seen in [Figure 5]. 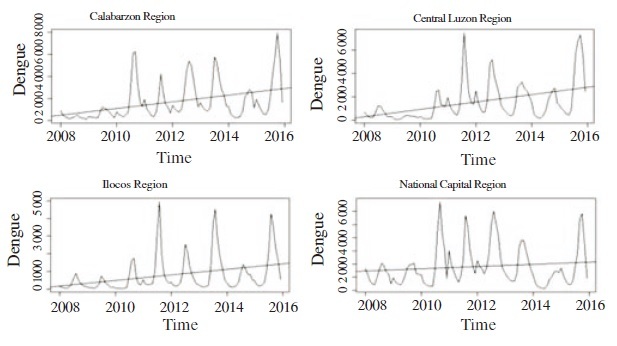 Figure 4: Time series of dengue cases in the four studied regions. 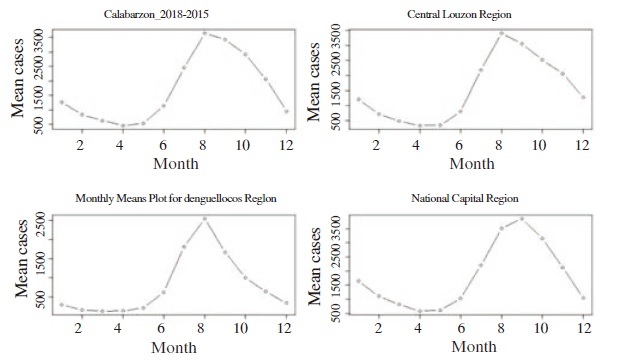 Figure 5: Monthly mean plots for dengue in the four studied regions. [Figure 6] shows a sample of the ARIMA fitting model plot for the four regions being studied, wherein, the black line represents the reported incidence of dengue, the fitted model in red, and the blue line serves as the predicted model in 2015. A comparison of the reported incidence and model fitted using a scatter plot [Figure 7] showed the regression function with its root mean square error value for a fitted period of the 2008 to 2015 data. The final model for each region was then confirmed using Ljung-box test of the residual with no correlation for fitted data. Figure 6: ARIMA forecasts of dengue in 2015 for the four studied regions. Figure 7: Scatter plot of dengue and fitted for the four studied regions. In order to validate the model, the best time series ARIMA model with final independent variables found for each region was applied to forecast incidence of dengue during January to December 2015. [Figure 8] shows the comparison of the predicted dengue cases with the reported incidence for Regions I, III, IV-A, and NCR. 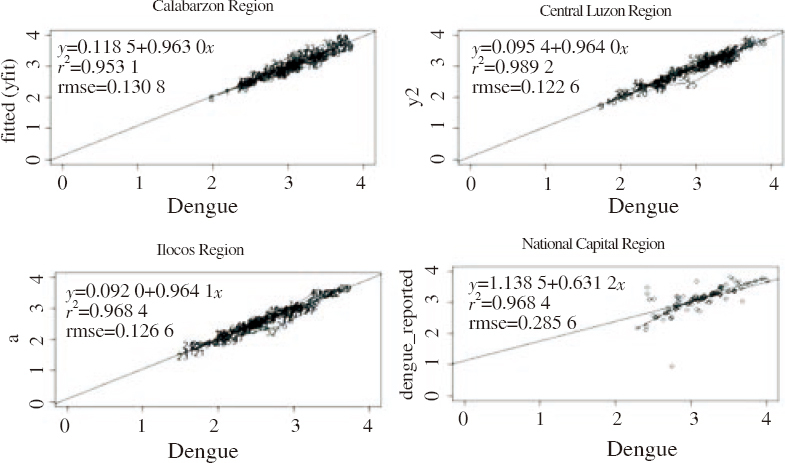 The results revealed that, in general, the modeled dengue at every region followed the trend of the reported incidence [Figure 8]A and showed a good linear regression with a square of correlation of 0.869 5 for the four regions [Figure 8]B. Figure 8: Dengue vs. forecasted for 2015. Evaluating the adverse health effects related to climate change often involves analysis of different geographical and temporal scales. Development of prediction models of smaller scale by using localized parameters, such as host condition, vector density, weather parameters, and other environmental variables could accurately project the actual risk of human cases. In this study, the researchers utilized different combinations of the best ARIMA model components obtained from four regions of the Philippines, namely, Ilocos Region, Central Luzon Region, CALABARZON region, and National Capital Region to investigate the influence of weather variability on dengue cases and predict future incidences. Time-series analysis was used for this study in establishing the relationship between the changes of weather parameter, environmental factors, and the incidence of infectious diseases like dengue,. Weather variables were selected based on the best correlation of dengue with precipitation, LSTd, LSTn, and NDVI at varying time lags for 2008-2015 period data. Numerous studies have supported this claim, for example, Sang et al. revealed that the occurrence of dengue fever is positively correlated with both temperature and precipitation but with different time lags. Whereas, Wang et al. showed that dengue is significantly associated with relative humidity. The results of the study revealed that climate is an essential driver of dengue incidence. Temperature is significantly associated with dengue incidence, which corresponds to the result of other studies,,. Temperature affects the potential spread of the dengue by shortening the extrinsic incubation period of the virus within its vector and the developmental cycle of the mosquitoes. The Philippines is considered a tropical country with monthly minimum temperature ranging from 22 °C to 26 °C year-round according to the Philippine Atmospheric Geophysical and Astronomical Services Administration giving a conducive environment for Aedes mosquitoes to propagate, thereby, increasing vector density and facilitating a faster spread of the virus. Rainfall also plays a crucial role in dengue transmission. It affects the life cycle of mosquitoes, such as mating and oviposition by providing a conducive habitat for propagation. Although this study finds rainfall as an important factor in predicting the incidence of dengue, other studies suggested that this variable did not have a significant role in the prediction of dengue fever,. The breeding sites for dengue vectors are mostly containers with water either filled manually or by rainfall. When vessels are manually filled for storage of water, vector quantity can then be basically independent of rainfall. Also, excessive rainfall leading to flooding can also remove vector habitats, thus, reducing the vector population. The result of validation exhibited the different performance of the ARIMA model in predicting the occurrence of dengue fever cases centered on weather factors. The correlation of the projected with the reported cases of dengue from January to December 2015 was found to be highly significant. However, it should be noted that the model was limited to the weather and environmental factors and did not consider other variables such as mosquito abundance, land cover, and population size. Furthermore, social factors such as population movement and importation of dengue fever cases were neglected in the study. Hence, further researches should be conducted that includes both socio-economic and ecological factors. This study focused on presenting climate and environmental factors in modeling and predicting dengue fever in four regions of the Philippines. A consistent dataset of GSMaP rain, MODIS LST and NDVI for the 2008-2015 period was processed and used in ARIMA models. The identification of these variables, which were significantly correlated with dengue incidence, allowed the researchers in incorporating them in ARIMA models as external regressors. The results revealed that the remote sensing-based time series model is capable of assessing the temporal dependence of dengue incidence in the study setting. The model could well reflect the trend of dengue fever incidence in the chosen locale. Predicted dengue incidence for January to December 2015 period described well epidemics of dengue that occurred highest in the rainy season. Such a finding could be used as a guide in developing an early warning model based on weather forecasts and in planning public health prevention programs. However, eliminating the contribution on human activities pose a significant challenge in existing statistical approaches in projecting and modeling of dengue occurrence. The authors would like to take this opportunity to thank all people who have helped in the completion of this project work. To Mr. Raphael Enrique Tiongco and Mr. Joseph Basconcillo for some technical support. This study is funded by the Asia Pacific Network for Global Change Research (APN) - CAF2016-RR11-CMY-Pham. Epstein PR. Climate change and human health. N Engl J Med 2005; 353 (14): 1433-1436. Haines A, Kovats R, Campbell-Lendrum D, Corvalan C. Climate change and human health: Impacts, vulnerability, and mitigation. Lancet 2006; 367 (9528): 2101-2109. Mcmichael AJ, Woodruff RE, Hales S. Climate change and human health: present and future risks. Lancet 2006; 367 (9513): 859-869. Costello A, Abbas M, Allen A, Ball S, Bell S, Bellamy R, et al. Managing the health effects of climate change. Lancet and University College London Institute for Global Health Commission. Lancet 2009; 373 (9676):1693-1733. Randolph SE, Rogers DJ. Remotely sensed correlates of phylogeny: Tick- borne flaviviruses. Exp Appl Acarol 2002; 28 (1-4): 231-237. Ebi KL, Hartman J, Chan N, McConnell J, Schlesinger M, Weyant J. Climate suitability for stable malaria transmission in Zimbabwe under different climate change scenarios. Clim Change 2005; 73 (3): 375-393. Epstein PR. Climate change and emerging infectious diseases. Microbes Infect 2001; 3 (9): 747-754. Gubler DJ, Reiter P, Ebi KL, Yap W, Nasci R, Patz JA. Climate variability and change in the United States: Potential impacts on vector- and rodent- borne diseases. Environ Health Perspect 2001; 109 (suppl 2): 223-233. Tong S, Dale P, Nicholls N, Mackenzie JS, Wolff R, McMichael AJ. Climate variability, social and environmental factors, and Ross River virus transmission: Research development and future research needs. Environ Health Perspect 2008; 116 (12): 1591-1597. Shuman EK. Global climate change and infectious diseases. N Engl J Med 2010; 362 (12): 1061-1063. Gubler DJ. Epidemic dengue/dengue hemorrhagic fever as a public health, social and economic problem in the 21st century. Trends Microbiol 2002; 10 (2): 100-103. World Hhealth Organization. Scientific working group report on dengue. Gevena: WHO; 2006. Ooi EE, Gubler DJ. Dengue in Southeast Asia: Epidemiological characteristics and strategic challenges in disease prevention. Cad Saude Publica 2009; 25 (suppl 1): 115-124. Wu PC, Lay JG, Guo HR, Lin CY, Lung SC, Su HJ. Higher temperature and urbanization affect the spatial patterns of dengue fever transmission in subtropical Taiwan. Sci Total Environ 2009; 407 (7): 2224-2233. Morin CW, Comrie AC, Ernst K. Climate and dengue transmission: Evidence and implications. Environ Health Perspect 2013; 121 (11-12): 1264-1272. Barbazan P, Guiserix M, Boonyuan W, Tuntaprasart W, Pontier D, Gonzalez JP. Modelling the effect of temperature on transmission of dengue. Med Vet Entomol 2010; 24 (1): 66-73. Ebi KL, Nealon J. Dengue in a changing climate. Environ Res 2016; 151: 115-123. Louis VR, Phalkey R, Horstick O, Ratanawong P, Wilder-Smith A, Tozan Y, et al. Modeling tools for dengue risk mapping: A systematic review. Int J Health Geogr 2014; 13 (1): 50. Chen SC, Hsieh MH. Modeling the transmission dynamics of dengue fever: Implications of temperature effects. Sci Total Environ 2012; 431: 385-391. Delmelle E, Hagenlocher M, Kienberger S, Casas I. A spatial model of socioeconomic and environmental determinants of dengue fever in Cali, Colombia. Acta Trop 2016; 164: 169-176. Xiang J, Hansen A, Liu Q, Liu X, Tong MX, Sun Y, et al. Association between dengue fever incidence and meteorological factors in Guangzhou, China, 2005-2014. Environ Res 2017; 153: 17-26. Hii YL, Zhu H, Ng N, Ng LC, Rocklöv J. Forecast of dengue incidence using temperature and rainfall. PLoS Negl Trop Dis 2012; 6 (11): e1908. 9 pages. Wu PC, Guo HR, Lung SC, Lin CY, Su HJ. Weather as an effective predictor for occurrence of dengue fever in Taiwan. Acta Trop 2007; 103 (1): 50-57. Ushio T, Sasashige K, Kubota T, Shige S, Okamoto Ki, Aonashi K, et al. A Kalman filter approach to the Global Satellite Mapping of Precipitation (GSMaP) from combined passive microwave and infrared radiometric data. J Meteorol Soc Japan. 2009; 87 :137-151. Wan Z. Collection-5 MODIS land surface temperature products users ' guide. Santa Barbara: ICESS, University of California; 2007. Ljung GM, Box GE. On a measure of lack of fit in time series models. Biometrika 1978; 65 (2):297-303. Martinez EZ, Silva EASd, Fabbro ALD. A SARIMA forecasting model to predict the number of cases of dengue in Campinas, State of São Paulo, Brazil. Rev da Soc Bras Med Trop 2011; 44 (4): 436-440. 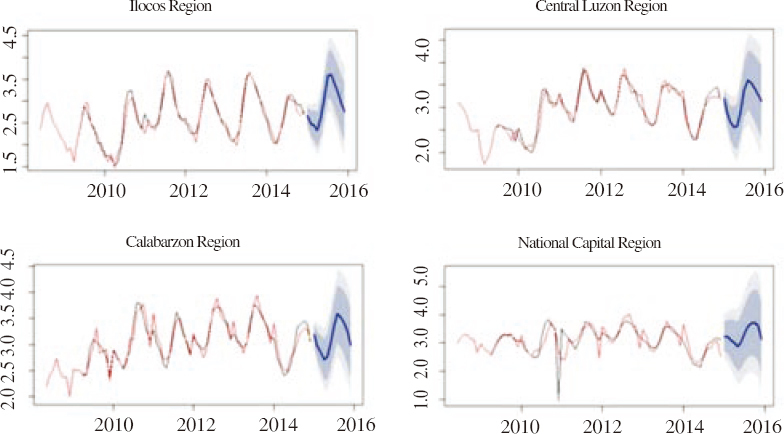 Johansson MA, Reich NG, Hota A, Brownstein JS, Santillana M. Evaluating the performance of infectious disease forecasts: A comparison of climate-driven and seasonal dengue forecasts for Mexico. Sci Rep 2016; 6: 33707. Wongkoon S, Jaroensutasinee M, Jaroensutasinee K. Development of temporal modeling for prediction of dengue infection in Northeastern Thailand. Asian Pac J Trop Med 2012; 5 (3): 249-252. Checkley W, Epstein LD, Gilman RH, Figueroa D, Cama RI, Patz JA, et al. Effects of El Nino and ambient temperature on hospital admissions for diarrhoeal diseases in Peruvian children. Lancet 2000; 355 (9197): 442-450. Pascual M, Rodo X, Ellner SP, Colwell R, Bouma MJ. Cholera dynamics and El Nino-Southern Oscillation. Science 2000; 289 (5485): 1766-1769. Sang S, Yin W, Bi P, Zhang H, Wang C, Liu X, et al. Predicting local dengue transmission in Guangzhou, China, through the influence of imported cases, mosquito density and climate variability. PLoS One 2014; 9 (7): e102755. Wang C, Jiang B, Fan J, Wang F, Liu Q. A study of the dengue epidemic and meteorological factors in Guangzhou, China, by using a zero-inflated poisson regression model. Asia-Pacific J Public Heal 2013; 26 (1): 48-57. Atique S, Abdul SS, Hsu CY, Chuang TW. Meteorological influences on dengue transmission in Pakistan. Asian Pac J Trop Med. 2016; 9 (10): 954-961. Lu L, Lin H, Tian L, Yang W, Sun J, Liu Q. Time series analysis of dengue fever and weather in Guangzhou, China. BMC Public Health 2009; 9 (1): 935. Tjaden NB, Thomas SM, Fischer D, Beierkuhnlein C. Extrinsic incubation period of dengue: Knowledge, backlog, and applications of temperature dependence. PLoS Negl Trop Dis 2013; 7(6): e2207.